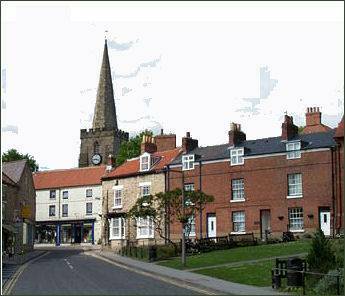 The market town of Pickering stands on the border of the beautiful North York Moors National Park and is known as a 'Gateway to the Moors'. Legend states that the town was founded by Celtic King Peredurus in around 270BC, who lost his ring and accused a young maiden of stealing it, later that day the ring was found in a pike caught in the River Costa. The name Pike-ring then changed over the years to Pickering. Following the Norman conquest, the town and its surrounding area were in the possession of the crown. In 1267 King Henry III gave the manor, castle and forest of Pickering to his youngest son, Edmund, Earl of Lancaster, it passed to Henry, Duke of Lancaster who usurped the throne of his cousin Richard II to become King Henry IV. Pickering has belonged to the crown since then. At the close of the sixteenth century the streets of Pickering were: East Gate, Hall Garth, Hungate, Birdgate, Borrowgate and West Gate. 'Gate' derives from the Old Norse word for street 'gata'. Many houses were constructed at this time, some of stone with thatched roofs. The stocks, shambles and the market cross stood in the centre of town in the Market Place. During the Civil War, Parliamentary troops were quartered in Pickering and caused damage to the church and castle, the town was the site of a minor Civil War skirmish. .In the decade of the 1650s George Fox, the founder of Society of Friends, or Quakers, visited the town to preach on at least two occasions. Nicholas Postgate (circa 1596 -1679), the Elizabethan Catholic martyr, lived for a time in Pickering. He was hanged, drawn and quartered in York at the age of 82, on 7 August 1679. A popular destination with visitors to the area, tourist attractions in the town include Pickering Parish Church, with its medieval wall paintings, Pickering Castle, the North Yorkshire Moors Railway and Beck Isle Museum. Pickering Castle (pictured right) was originally built as a timber earth motte and bailey structure by William the Conqueror during the suppression of the north of England. The Norman timber castle was replaced in stone in the twelfth century. The present inner ward was built between 1180 and 1187. The stone shell keep dates from 1216 and 1236, as does the chape. Between 1323 and 1326 an outer ward and curtain wall was constructed along with three towers. 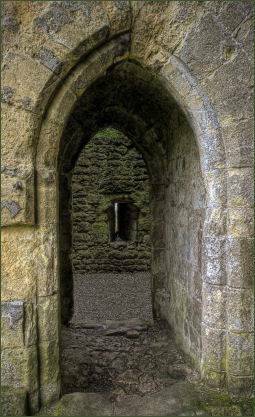 A gatehouse, hall and storehouses followed. The castle was used by a succession of medieval Kings as a hunting lodge who used the adjacent forest for hunting deer and wild boar. The North Yorkshire Moors Railway is a heritage railway. The 18-mile (29 km) line is the second-longest heritage line in Britain and runs across the moors from Pickering via Levisham, Newton Dale and Goathland to Grosmont. It is run by the North York Moors Historical Railway Trust and operated and staffed by volunteers. Pickering station has been its terminus since 1965. 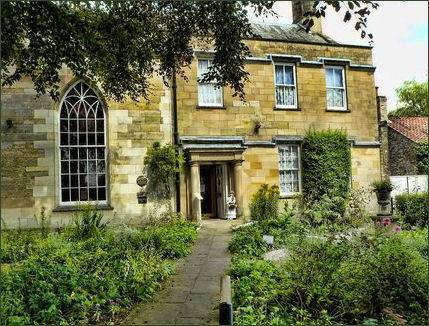 The interesting Beck Isle Museum, Pickering (pictured above left) is housed in a handsome Regency building near the centre of the town, it stands by Pickering Beck, a stream which flows under a four-arched road bridge. The museum contains a collection of items relating to the rural crafts and lifestyle of Ryedale. The collection is not restricted to a particular period, but aims to reflect local life and customs and trace the developments in social and domestic life during the last 200 years. A selection of photographs from the Sidney Smith collection held in the museum are displayed around the building, particularly in the photography and model rooms.. The museum is owned by the Beck Isle Museum Trust. Near to the town is the well known theme park Flamingo Land,a great day out for families, attracting around 1.8m visitors per year. The church dates to the twelfth century and is notable for its mid fifteenth century wall paintings, which adorn the north and south nave walls. They are remarkable for their detail, quality of artistry, and superb state of preservation. The wall paintings were plastered over at the time of the Reformation, but were rediscovered in 1852. They were then whitewashed but were restored in the 1870s. They depict St George slaying the dragon, next to St Christopher carrying a Christ child, followed by a scene of St John the Baptist being beheaded. The Coronation of the Virgin Mary, and the martyrdom of St Edmund (pictured right) are also depicted. 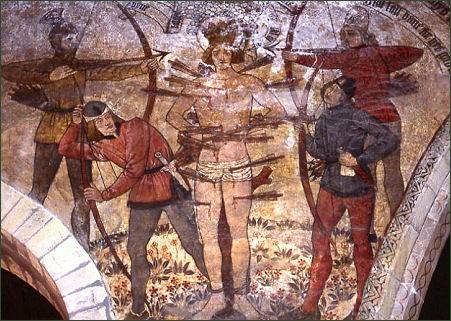 Above St Edmund, being shot with arrows, is the martyrdom of St Thomas Becket in Canterbury Cathedral. On the south side of the nave is a large painting with scenes from the life of St Catherine of Alexandria, the Seven Acts of Mercy, and several different pictures of the Virgin Mary. These are followed by a strip showing the Passion and Crucifixion, and a scene of The Descent into Hell, with sinners in the jaws of a dragon. This is followed by a scene of the Resurrection. A late Saxon church once occupied the site, of which the font and a section of a cross shaft survive. Two chapels lie off the chancel. The first of these was established as a chantry by Sir William Bruce in 1337. His stone effigy lies beside the lectern and depicts him clad in armour. Near the effigy are several beautifully carved fourteenth century column capitals depicting grotesques. A second chapel was added in 1407 by Sir David and Lady Margery Roucliffe, whose table tomb with alabaster effigies lies against the south west wall.